Ed Scott drives the truck to the waiting flatbed. 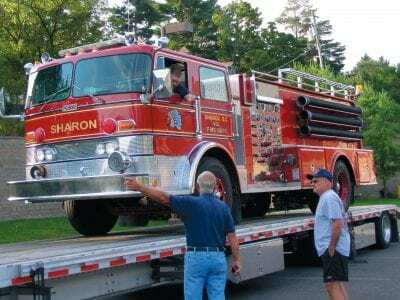 Dry eyes were at a premium outside Mahopac FD headquarters early Tuesday morning when an old friend—a 1977 Oren fire truck that served the region’s firefighting force with pride and distinction for 35… Please login below or purchase a subscription to the Putnam County Courier to access this content. Not too bright—that’s the way Carmel Police reacted to four teens who, after allegedly damaging 20 mailboxes in the Mahopac-Mahopac Falls-Carmel area Monday, were nabbed when one of the youths reportedly posted a photo of the crime on Instagram. The… Please login below or purchase a subscription to the Putnam County Courier to access this content. Native Americans C.J. 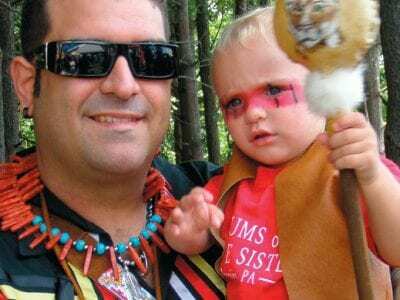 Van and his 13-month-old son, Boy Who Runs with Cougar, travel from Pittsburgh to Putnam County for the pow-wow. Large crowds were on hand at the Putnam Veterans Memorial Park last weekend for what has become a late summer&rsquo… Please login below or purchase a subscription to the Putnam County Courier to access this content. 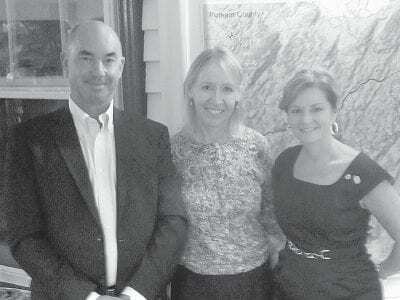 John Eustice, Libby Pataki, and MaryEllen Odell. 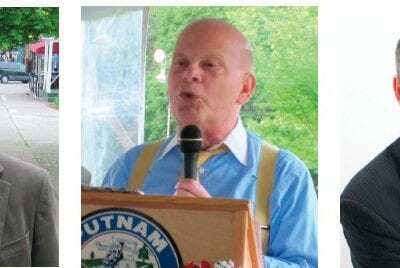 On the porch of Libby and George Pataki’s home overlooking the Hudson River, bicycling enthusiast and businessman John Eustice on Monday evening pitched his vision for the Putnam Cycling Classic…. Please login below or purchase a subscription to the Putnam County Courier to access this content. Caleb and Caitlyn McLaughlin of Carmel flash their wonderful smiles. Caleb and Caitlyn McLaughlin are Broadway bound! Caleb, 10, a 6th grader at the George Fischer Middle School in Carmel and his 6-year-old sister, a 2nd grader at Kent Primary School… Please login below or purchase a subscription to the Putnam County Courier to access this content. Terry Gipson Stephen Saland Neil Di Carlo For years in New York state, incumbents in the state Legislature faced little opposition, and most won even if they did have a solid opponent. Redistricting helped preserve incumbents, keeping the Assembly in… Please login below or purchase a subscription to the Putnam County Courier to access this content. 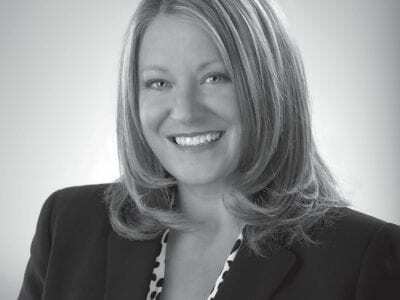 From The Chamber The month of August is a great time to spend seven days in exotic destinations such as—Putnam County. Seriously. Let’s consider a few options. Start with a Saturday outing on Lake Mahopac with its full service marinas, boat ren… Please login below or purchase a subscription to the Putnam County Courier to access this content. 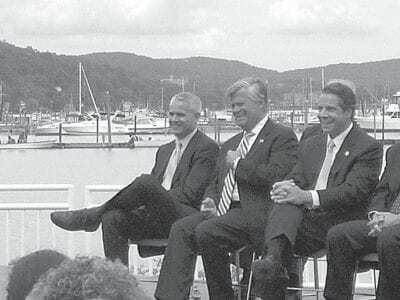 Putnam County Executive MaryEllen Odell in Tarrytown last week, said, “This project is more than likely one of the largest projects that New Yorkers will be undertaking as far as transportation infrastructure projects. American history tells us… Please login below or purchase a subscription to the Putnam County Courier to access this content. The news is encouraging. Private sector employment in the tricounty Putnam-Westchester-Rockland region grew by 3.1 percent for the 12 month period ending July 31, 2012. The job growth was the largest recorded by the New York Department of Labor stat… Please login below or purchase a subscription to the Putnam County Courier to access this content.